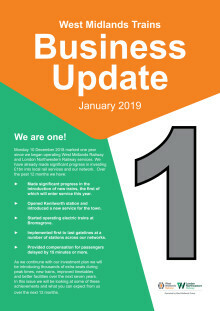 The presentation given to stakeholders at our Stakeholder Conference and Transport Integration Forum on Tuesday 9 April 2019. 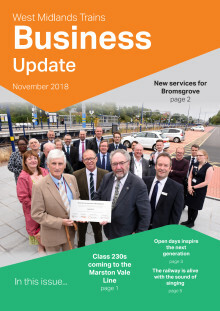 Community Rail is an important element to the West Midlands Trains franchise and is at the heart of the London Northwestern Railway Customer Experience Directorate. We have three extremely engaged and active award-winning Community Rail Partnerships, as well as 26 station adoption groups. This report looks back on the first year of this franchise and documents the progress which has been made. 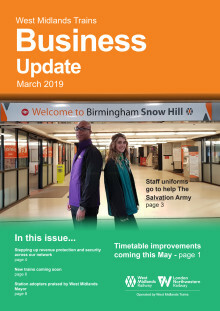 Community Rail is a key component of the Customer Experience Directorate at West Midlands Railway and we are working to introduce community activity at all of our 114 stations. 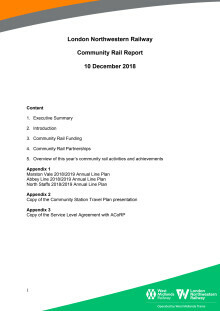 This report covers the key community rail activities of the past year, outlines the strategic goals with committed obligations that have been delivered and provides summaries of projects for the year ahead. Please note this is not a final document and is subject to some small changes. 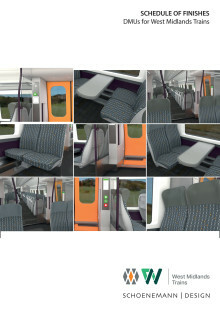 However, this is how the new interiors might look. 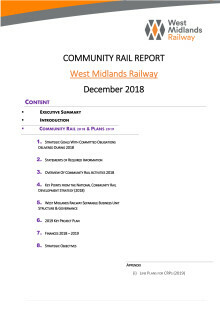 The West Midlands Railway stakeholder briefing spring 2018 presentation can be found here.